Lake Vyrnwy Hotel & Spa is blessed with a truly spectacular setting. Located on the hillsides of the Berwyn Mountain range, the hotel commands panoramic views of majestic mountains, forests and beautiful Lake Vyrnwy. There are 24,000 acres of National Nature Reserve waiting to be explored, including an RSPB sanctuary, a Site of Special Scientific Interest (SSSI) and a Special Area of Conservation. Needless to say, the scenery and the walking is outstanding. The hotel Spa looks out across these inspiring landscapes – quite literally setting the scene for pure relaxation. Its thermal suite and luxurious ESPA treatments complete a magical spa experience. 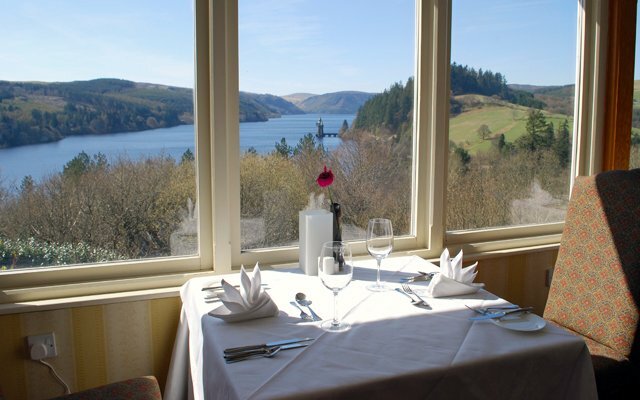 Eating and drinking at Lake Vyrnwy Hotel is a wonderful experience too, whether enjoying three courses in the award-winning Tower Restaurant – whilst watching the setting sun over the lake – or a delicious dish in the gastro-pub style Tavern Brasserie. 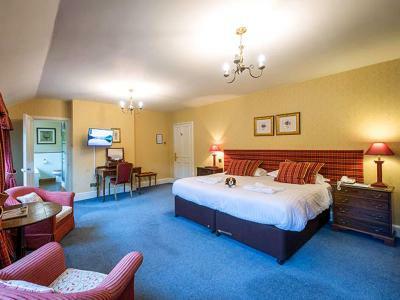 No two bedrooms are alike at Lake Vyrnwy Hotel; from contemporary-style Premier Lakeview rooms with huge panoramic windows, to Lakeview rooms, situated in the original Victorian country house part of the hotel and exuding their own special period charm. The 'essentials' are there, like complimentary Wi-Fi, with flourishes of luxury, such as crisp Egyptian cotton sheets. Most rooms benefit from a separate bath and shower. Room service is available. Period style en suite bedroom offering free Wi-Fi, satellite TV, digital radio, writing desk, direct dial telephone, alarm clock, ironing station, tea and coffee making facilities, bathrobes, toiletries, hairdryer, and key card access. These rooms have views of the hotel’s manicured lawns leading up to the tennis courts. Period style en suite bedroom offering free Wi-Fi, satellite TV, digital radio, writing desk, direct dial telephone, alarm clock, ironing station, tea and coffee making facilities, bathrobes, toiletries, hairdryer, and key card access. 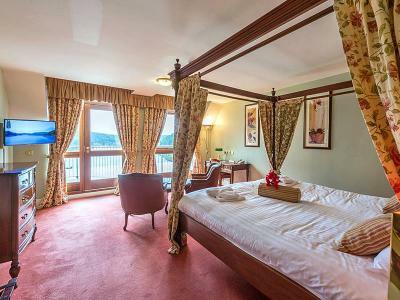 These rooms have spectacular views over Lake Vyrnwy. Contemporary style en suite bedroom offering free Wi-Fi, satellite TV, digital radio, writing desk, direct dial telephone, alarm clock, ironing station, tea and coffee making facilities, bathrobes, toiletries, hairdryer, and key card access. These large rooms have feature beds and big panoramic windows to make the most of the stunning views. Most rooms also have a private balcony that allows you to take in the romantic evening air. Take the A5 towards Oswestry. Turn left onto A458 towards Welshpool. After a few miles, turn right onto B4393 (signposted to Lake Vyrnwy, 28 miles). Follow this road all the way to Lake Vyrnwy. Take the road on the right hand side of the lake (B4393) and then look out for the hotel driveway on the right hand side. There's something rather special about dining in the award-winning Tower Restaurant at Lake Vyrnwy Hotel. The à la carte restaurant menu showcases the finest ingredients the region has to offer, including lamb, game and fish from the country estate that surrounds the hotel. Find the perfect wine to accompany your meal, with a selection of more than a hundred to choose from. And savour the moment as much as the food, with sublime views across Lake Vyrnwy and the wonderful countryside that frames its shores. Simple, delicious food is the hallmark of the gastro-pub style menu in the Tavern Brasserie. Savour a mouth-watering Vyrnwy beef burger, freshly prepared using local Welsh Black beef. The Tavern Bistro has an outdoor terrace for al fresco dining in summer and cosy, crackling log fires during the winter. Lake Vyrnwy Hotel has its own traditional, local country pub within its grounds. Opened in 1890 as 'The Tap Room' it's popular with both locals and hotel guests, serving local ales from Wales and the Welsh Borders - such as 'Station Bitter' and 'Montys' - and local ciders. Relax in an authentic country pub environment after a day's exploring. The wonderful tradition of afternoon tea is taken to a new level at Lake Vyrnwy Hotel & Spa. Freshly baked scones with cream and homemade jam, fingers sandwiches, biscuits and a choice of teas and coffees can be savoured whilst gazing out across the magnificent landscapes for which Lake Vyrnwy is renowned. Both traditional afternoon tea and champagne afternoon tea are available to order. Afternoon tea can be booked in advance, at a special price, when booking your room via ClassicBritishHotels.com. In the summer, dining at Lake Vyrnwy reveals an altogether different flavour. Take a seat in the fresh open air – sunny or shade – and dine al fresco. The gastro-style pub, The Tavern Brasserie, offers terrace dining in the summer overlooking the lake, and the fine dining Tower Restaurant also features a terrace for guests to enjoy lunch and afternoon tea in the glorious weather, again with breathtaking lake views. The unique surroundings of Lake Vyrnwy present a wonderful setting for private dinners and celebrations. The hotel caters for reunions, anniversaries, family gatherings, birthday parties, charity and club events, and business dinners. 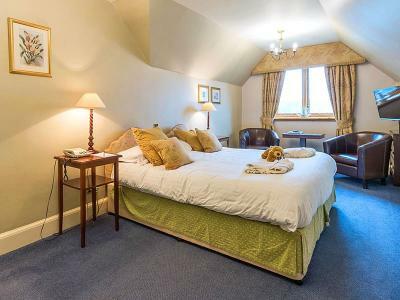 Choose from a range of private rooms, all with stunning views over the lake. Call Classic British Hotels on 0844 967 0984 for advice and let us help you organise a memorable private dinner. Spa access: day access to the Spa is charged at £10.00 per person. Access is complimentary when you spend £80.00 or more on spa treatments (per person on any given day). There was not always a lake here! When the Victorians first flooded the Llanwddyn Valley to create Lake Vyrnwy, in 1899, they stocked the lake with 40,000 Loch Leven trout, making it the largest wild trout fishery in England and Wales. Today, guests can enjoy exclusive fishing on this 11,000 acre lake, at one of the finest still water fisheries in the UK. Loch-style fishing is limited to just 10 boats, preserving the tranquil nature of the sport and providing you with a real chance to catch a fish up to 9lbs. Lake Vyrnwy is one of the country’s top sporting estates, so if you’re eager to explore the breathtaking landscapes that surround the hotel, you may want to take in the scenic locations whilst enjoying some or all of the activities that the estate has to offer. Activities include bird watching, cycling, abseiling, archery, game shooting, clay pigeon shooting, sailing, canoeing, kayaking and even white water rafting. And of course, there is an abundance of walking and nature trails, whether it’s a lakeshore stroll over 11 miles of flat terrain or an RSPB nature trail through ancient woodland, as old as the last ice age. The preserved railway at Bala Lake offers a 9 mile return journey following the contours of its shores, through the beautiful Snowdonia National Park. Hop aboard a narrow gauge steam train at Llanuwchllyn, where the Victorian signal box still operates, and take in the serene lake and mountain landscape. Built in the late 13th Century by Edward I, the Castle’s roll as a sentinel standing watch over the mountainous Welsh landscape - part of his ‘iron ring’ of fortresses - is still evident to this day. This medieval, architectural masterpiece treats visitors to spectacular panoramic views from its lofty battlements. Built around 1200, today this medieval castle houses a magnificent collection of paintings, sculpture, furniture and tapestries; with a horde of Indian treasures on show in the Clive Museum. It is for its formal gardens, however, that Powis is renowned. A true baroque garden, influenced by Italian and French styles, it is noted for its terraces overhung with clipped yews. This area of outstanding natural beauty contains some of the most stunning scenery in Wales. Take a day to explore the mountains, lakes, woodlands, valleys, river gorges, waterfalls, Stone Age burial chambers, Roman forts, churches, castles and picturesque villages. Lake Vyrnwy Hotel has a truly unique location amidst the spectacular mountain, lake and woodland scenery of a 24,000 acre country estate. This very special setting makes Lake Vyrnwy Hotel as an exceptional venue for training and team building events. A huge range of activities can be arranged, including Zorbing, Acrobat Schools, raft building, clay shooting, off-road driving and helicopter rides. The Wintergreen Suites comprise three meeting rooms - all with lake views - seating up to 200 delegates in a theatre-style layout. Lake Vyrnwy Hotel & Spa is less than 2 hours drive from Birmingham, Liverpool and Manchester.